Many towns in Sicily celebrate Easter with rituals that are a rich blend of faith, folklore, tradition and community. 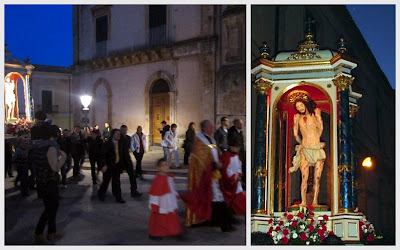 We wanted to experience some of the Easter processions and chose to stay in the town of Ragusa Ibla (one of the UNESCO listed Baroque towns in south-eastern Sicily) for Holy Week this month. The image of Jesus crowned with thorns was transported on Holy Monday (Lunedì Santo) between two rows of devotees, each holding votive candles and accompanied by the sound of a solemn brass band. The procession proceeded to the Duomo San Giorgio. On Holy Tuesday (Martedì Santo), the procession with the statue of Veronica left from the Church of Purgatory. Led by hundreds of the faithful, they wove their way through narrow streets and wide piazzas until they finally arrived at the Cathedral. 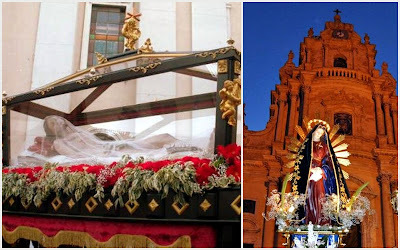 Two statues were carried to the Duomo San Giorgio on Good Friday (Venerdì Santo) one of Christ in a glass casket followed by Our Lady of Sorrows (La Madre Addolorata). The entire community is involved in these important religious events. I admire the emotional and spiritual connection that the local people have with these ceremonies and the way in which the men help one another to skilfully carry and manoeuvre the large, heavy statues up and down the steep steps. I love the fact that the citizens of Ragusa Ibla continue to keep all its medieval traditions and festivals alive. What is really amazing about these events is that they are not done for the benefit of tourists or visitors; they are done because they have always been done. For us it was a great pleasure to witness them and get a glimpse into the past. Anyone with any historical or cultural interest in Italy, should have this experience, we cannot recommend it highly enough. Dear Nora, thank you very much for this great post! You really had a fantastic "settimana Santa". I like your night photos very much! Waiting for your next posts about fabulous Sicily. Brava for this wonderful post, Nora! You've really captured Easter in Ibla, and you are so right that the traditions in Sicily have nothing at all to do with tourists. They are at the very core of life here. Thank you so much for your kind comment Jann! You have chosen such a wonderful place to live in Sicily. I miss Ragusa Ibla but through your beautiful blog I can continue to see it.